Summary: This project will fund two (2) part-time temporary positions to perform nightly lighting compliance surveys along twenty-one (21) miles of developed, incorporated shoreline adjacent to the Archie Carr National Wildlife Refuge during sea turtle nesting season. Brevard County pro-actively enforces it’s lighting ordinance in the unincorporated areas, but has no enforcement authority within the six (6) municipalities that comprise 21 twenty-one miles of nesting habitat where code enforcement is limited by municipal budget constraints. To augment code enforcement efforts, the grant funded lighting surveyors will move down the beach municipality by municipality and photo-document each non-compliant light visible from the beach and record the location. The photos will later be downloaded into a PowerPoint presentation that will be put on a CD and provided to each municipality along with a data sheet of accompanying information. The photos and data sheets will maximize the effectiveness of municipal code enforcement efforts and prompt code enforcement action. This project will increase lighting compliance and improve sea turtle habitat. Results: On June 14th, 2010, lighting surveyors began surveying for residential and commercial lights visible from the beach in the Town of Melbourne Beach, Indialantic, Indian Harbour Beach, Satellite Beach, Cocoa Beach, and Cape Canaveral. The employees verified each light source, documented the address and exact location of each visible light and simultaneously photo-documented each visible light. Visible FPL street lights were also noted. As each municipality was completed, the lighting surveyors created a PowerPoint presentation using the photos. The data collected was put into an accompanying spreadsheet that provided more specific details. After a suggested remedy was added, the PowerPoint and spreadsheet files were furnished to each Municipality Manager and Code Enforcement Officer so that appropriate action could be taken. The data collected in 2010 did show an increase in the nest/disorientation ratio for most areas although overall, the nest/disorientation ratio decreased. 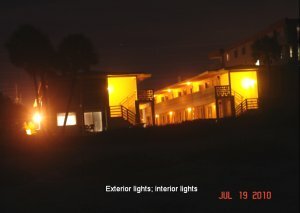 When analyzing the 2010 PowerPoint files, it is clear that interior light sources still make up a large percentage of the total lights visible from the beach. In the Town of Melbourne Beach, several disorientation events occurred in front of the Breakers Condominium. Although the Breakers’ exterior lighting is “turtle friendly” interior lighting can be seen in both the original survey and in the follow-up survey. Education efforts focused on interior lighting will continue. Several properties directly associated with disorientation reports were among those retrofit with “turtle friendly” fixtures and bulbs by the end of the 2010 season, although in the Town of Indialantic, several disorientation events continued to occur in the area adjacent to the popular Boardwalk.